lenNY's Yankees - A Bronx Bombers Blog: 5th Featured Yankee Card of the Week! 5th Featured Yankee Card of the Week! I felt it was time to show CC Sabathia a little love. I know he's not a Yankee in this picture, but this is the next best thing I had - especially since he's starting against the Indians this Thursday night for the Yanks' home-opener. 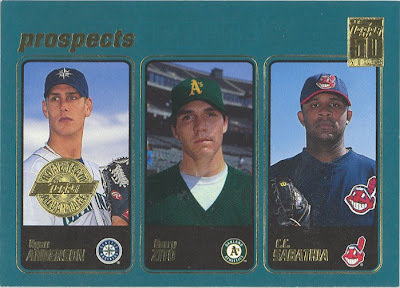 It is a 2001 Topps Prospects card of Ryan Anderson, Barry Zito and CC Sabathia - all three are lefty pitchers. Anderson never made it to the show, but Zito and Sabathia did. The gold patch in the upper right represents Topps' 50 year anniversary. Hopefully this card will bring luck to Sabathia in his second huge game for the Yankees this Thursday. One of the almost best Rookie Cards was in the 60s. Instead 67 had Ryan with Jerry Koosman and to Most Fans it was a Koosman Card as Jerry Koosman was the better pitcher early on.